Delusional disorder, previously referred to as paranoid disorder is a type of serious mental illness involving psychosis. Psychosis is the inability to tell what is real from what is imagined. The main feather of delusional disorder is the presence of delusions. People with this disorder experience non-bizarre delusions, beliefs of something occurring in a person's life which is not out of the realm of possibility, which have persisted for at least a month. Sometimes, people with delusional disorder might become so preoccupied with their delusions that their lives are disrupted. • Erotomanic- A person with this type of delusional disorder believes that another person often someone famous, is in love with him or her. The person might attempt to contact the object of delusion or even stalk them. • Jealous- A person with this type believes that his or her spouse or sexual partner is unfaithful. • Somatic- A person with this type believes that he or she has a physical defect or medical problem. • Grandiose- A person with this type has on over inflated sense of self-worth, identity and power or knowledge, further believing that he or she has a great talent or has made an imperative discovery. • Mixed- A person with this type has two or more types of delusions listed above. The exact cause of delusional disorder is not yet known. However, researchers are still studying the role of various genetic and biological factors that may be involved. 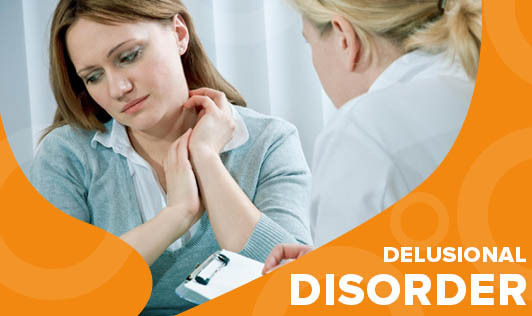 Treatment for this disorder often includes medication and psychotherapy.